No Nukes | WHAT A FEELING! The shame of No Nukes is that is seems completely unaware of the fact that it is working against its own very noble cause. As we watch concerned and serious people talk about something which should matter to us all—nuclear power, its uses and abuses—there is an almost Hitchcockian pull against what we know to be right: Shut up, let’s get to the concert footage, man! A moment later, the guilt sets in, and we check ourselves; at least, good soul that I am, I checked myself. Some of the crowed I saw the movie with sent continuous bad vibes toward the screen during moments like Graham Nash nodding solemnly with Ralph Nader (no doubt about it, a pretty insufferable scene). And such moments are interspersed throughout the movie; a funky James Taylor number ends, and just as you start to feel the rhythm of the film, talking heads will reel off a series of facts and figures about nuclear accidents. These are things we all should know, they matter, but that’s the great miscalculation of the filmmakers: they’ve made an important subject irritating. Even those with hearts most definitely in the right place can’t help wanting to see the cinematically alive Carly Simon rather than the deadish types who are seen planning the giant Madison Square Garden concert. And now here I am, yakking away about that stuff instead of talking about the stars—hmmm. Well, if you must know, Taylor and Simon are a lot of fun, Jackson Browne (who is surprisingly perky backstage—I’d always pictured him as a glum chap) does a dynamite “Running on Empty,” and there is a revolting audience participation on Graham Nash’s “Our House.” There’s little of the cinematic grace of The Last Waltz so it’s up to the individual’s performance to carry things off: luckily, some of the individuals are up to it. I supposed there’s not much of the cat left to be let out of the bag, but it certainly must be said that Bruce Springsteen is magnificent. It does seem likely that the lad has some sort of future in film acting; energy flies off the screen when he occupies it. Whether or not someone harnesses Springsteen’s overripe (and quite marvelous) theatricality and works it into the subtler world of feature filmmaking could be one of the interesting questions in movie acting during the Eighties. The Informer was the newsletter of the Seattle Film Society, and this was one of the early reviews I wrote for it. 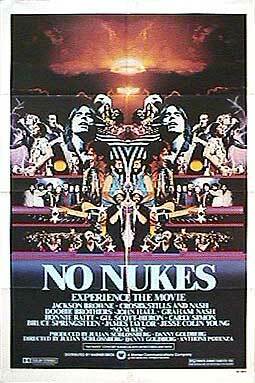 No Nukes: even the title is nostalgia now; final stages of Mutually Assured Destruction and all that. Kind of hard on Graham Nash here, who seems like a perfectly nice, sincere man. I don’t remember what was so offensive about “Our House.” You may have heard the Springsteen thing didn’t work out the way I thought it might. Except for a couple of the videos he did for the Born in the U.S.A. album, Springsteen didn’t go in the direction of the movies, and that’s perfectly fine, as he had other things to do. I guess I liked Carly Simon, too.